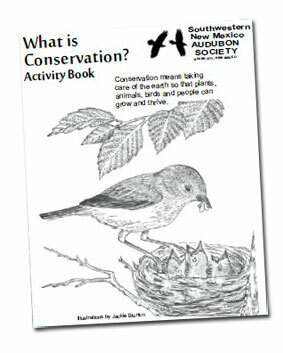 This SWNM Audubon activity book for kids is understandable to young children, inexpensive, and easy to produce in small quantities - single fold booklets that can be printed on 8.5 x 14 copy paper in any quantity needed. 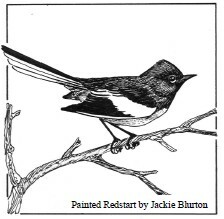 The first booklet was inspired by our Chapters gift of the Audubon Bird House Book by Barker & Wolfson to libraries in our area and by the Silva Creek Botanical Garden that the Gila Native Plant Society is creating in Silver City. 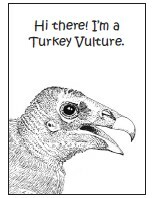 Our second book for kids is about birds. There are many different kinds of birds. 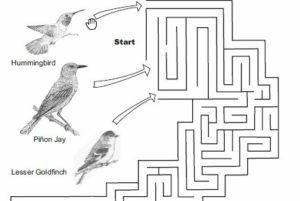 To help us identify birds with similar characteristics, they are grouped into families. Here are three families of birds that share characteristics. Knowing these similarities will help you identify the bird. Birds prefer different plants just like you and I like different foods. Birds and plants can help each other. Here are three birds that have beneficial relationships with the plants that provide them with food. The book has four activities about birds and the food they eat. Swallows are common residents in the summer. They live together in groups called “colonies” and build their mud homes in cliffs, under bridges and under the eaves of buildings. They often fly together in flocks while they hunt for insects that they capture in mid-air. Swallows have sleek, streamlined bodies and long narrow wings which allow them to turn quickly to catch insects. Different species look similar in shape but have distinct color patterns that make them different from each other. 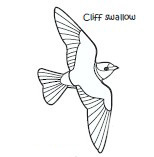 The Cliff, Barn, Violet-green and Northern rough-winged swallows live here all summer to nest and raise their families. The Tree swallow and Bank swallow migrate through here on their journey north. 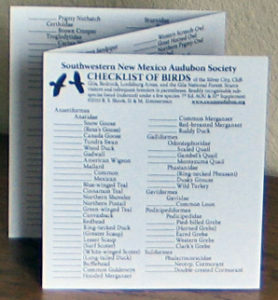 The Southwestern New Mexico Audubon publication Checklist of Birds, by R. Shook and D. & M. Zimmerman, follows the latest AOU and 51st Supplement order of listings. Covering the area of Silver City, Cliff-Gila, Redrock, Lordsburg and the Gila National Forest, the 3-fold card identifies visiting and infrequent breeding birds and notes readily recognizable sub-species. There is space to record date and/or number of birds seen, and small enough (3 ¾ by 4 ¼) to fit in your pocket. Checklists are 50 cents each, or 5 for $2 and for purchase at SWNM programs, [ 1st Friday of each month ] and on [ field trips ]. 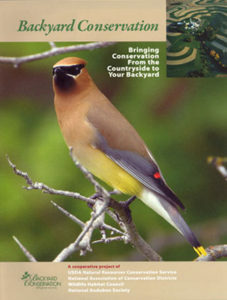 National Audubon, Natural Resources Conservation Service, and other conservation groups, along with the National Resource Conservation Service have co-produced a beautiful 28-page color booklet named "Backyard Conservation" showing you how farm and ranch conservation practices can be adapted for use in any size front yard or back yard. Some Conservation practices highlighted are mulching, composting, terracing, nutrient management, pest management, tree planting, ponds, wetlands, wildlife habitat, terracing and water conservation. The FREE booklet is available in English or Spanish as a service provided by Southwestern New Mexico Audubon. Pick one up at the next chapter program meeting, first Friday of each month. Domestic cats can make wonderful pets. But when allowed to roam outdoors, these introduced predators have serious consequences. Cats have been introduced into new habitats across the globe with terrible results. Outdoors, cats are a non-native and invasive species that threaten birds and other wildlife, disrupt ecosystems, and spread diseases. 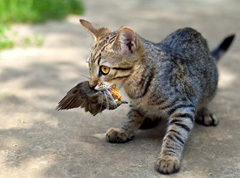 Now numbering well over 100 million in the United States, cats kill approximately 2.4 billion birds every year in the U.S. alone, making cat predation by far the largest human-caused mortality threat to birds. Big Ditch Park, San Vicente Creek, Boston Hill, La Capilla Wetlands (PDF). 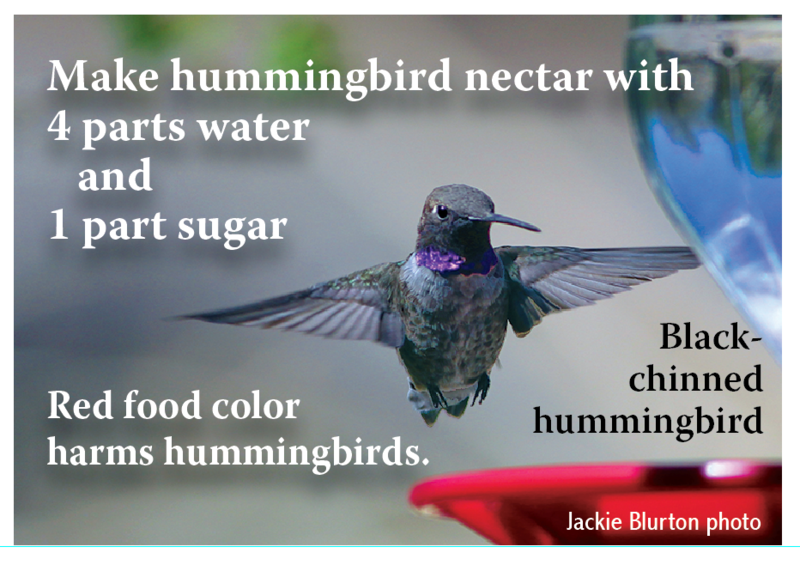 Get one at Audubon Programs or at the Visitors Center, 201 N Hudson, Silver City, NM. He found DietSpotlight.com that has a section titled, Bird Watching Beginner’s Guide for Hobby, Health & Wellness - 10 Things You Need to Know. In addition to the potential for weight loss, it is a nice resource for beginning birdwatchers, with links to information, useful even for advanced birders. Thank you, Derrick! Did you know that you are required to have a permit to use certain wildlife management areas for hiking, biking and bird watching? WHERE and the Online Permit Purchase system is at wildlife.state.nm.us.